... to make printing of your address, price, cable, shipping or office folder labels a most enjoyable task! Please STOP & READ This Before Placing Your Order! Most suppliers of similar Bluetooth label writers DON'T want you to know that custom label makers are often cheaply made, with flimsy unit lids that get popped up in a breeze or break after a while. Also, poor Bluetooth connectivity is a common pain, making it hard to print more than a couple of labels in a row, as the device gets stuck and consistent printing becomes a torture! Get The Thermal Label Maker That Stands Out For Its Quality! Offer high-end PUQU label maker set to any loved professional and enjoy their ear-to- ear smile! Help them print in no time clear, stunning labels the SMART WAY and have them thankful for your choice! Click Add To Cart NOW To Get Get Yours! ❤【KILLER MONEY SAVERS!】Steer clear of expensive inks and toners with the #1 thermal label maker on the market! Reap the benefits of THERMAL PRINTING TECHNOLOGY that eliminates costly replacement of your printing supplies! The RECHARGEABLE BATTERY with the 180-day standby capacity saves you extra money on new battery purchase, turning your label maker kit into a GREAT VALUE set! ❤【CONNECT IN A BREEZE THROUGH YOUR SMARTPHONE!】Just connect through your smartphone and have your labels printed in no time! Excellent Bluetooth connectivity through FREE PUQU printing app allows for CONSISTENT support for Android and iOs. Save yourself the torture of disrupted connection that so often torments users of similar Bluetooth label makers! ❤【WE TAKE YOUR LABEL PRINTING TO PERFECTION!】Forget all about flimsy label maker tools that get stuck, giving you a headache in printing the labels you need! Get neat, clear price labels, cable labels, jewelry labels, address labels, folder labels or express delivery labels in a breeze with the best label maker machine. EASY, FAST, CONSISTENT printing of all your labels up to 2.0''x3.2'' ! Instruction please check our homepage on YOUTUBE:"https://www.youtube.com/channel/UCZfn8yxDzZmP2lu_DudkOPw"
❤【YOUR TRAVEL BUDDY EVERYWHERE!】Lightweight and compact to follow you everywhere, this portable label printer is made for your convenience! Take it with you on your business trip and enjoy smart label printing in no time! Use it as your shipping label wireless printer or your office label maker for long years, thanks to its STURDY, DURABLE, LONGLASTING manufacture! ❤【GET A COMPLETE LABEL MAKER KIT!】Get EVERYTHING you need for your quality label printing! 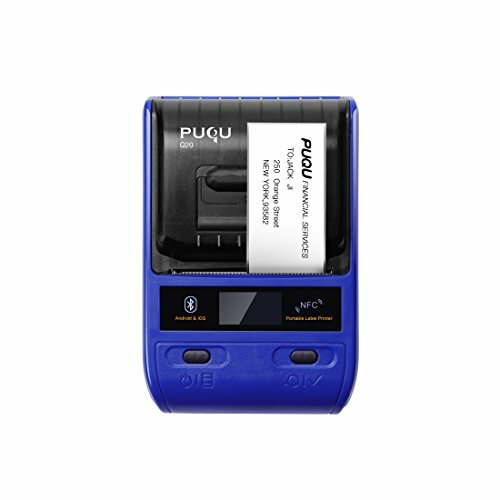 Our kit includes the PUQU Q20 label printer, the AC adapter, the rechargeable lithium ion battery, the label adjusting board, 18-month warranty, the users' manual, one random size label paper roll. We are offering you a TREMENDOUS VALUE set that guarantees your 100% satisfaction!puqu1773@hotmail.com! If you have any questions about this product by PUQULABEL, contact us by completing and submitting the form below. If you are looking for a specif part number, please include it with your message.